Nepal, officially the Federal Democratic Republic of Nepal (संघीय लोकतान्त्रिक गणतन्त्रात्मक नेपाल), is a landlocked sovereign state located in South Asia. With an area of 147,181 km² and a population of approximately 27 million, Nepal is the world’s 93rd largest country by land mass and the 41st most populous country. 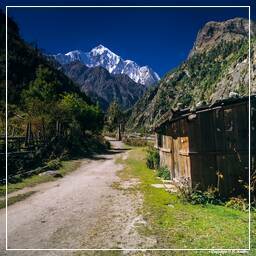 It is located in the Himalayas and bordered to the north by the China, and to the south, east, and west by the India. Specifically, the Indian states of Uttarakhand, Uttar Pradesh, Bihar, West Bengal, and Sikkim border Nepal, while across the Himalayas lies the Tibetan Autonomous Region. Nepal is separated from Bangladesh by the narrow Indian Siliguri corridor. Kathmandu is the nation’s capital and largest metropolis. 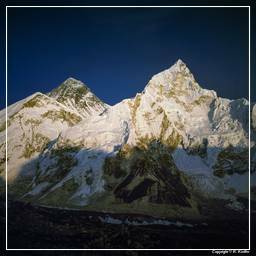 The mountainous north of Nepal has eight of the world’s ten tallest mountains, including the highest point on Earth, Mount Everest, called Sagarmatha in Nepali. It contains more than 240 peaks over 6,000 m above sea level. The southern Terai region is fertile and humid. Lumbini, the birthplace of Lord Gautam Buddha, is located in this region. Lumbini is one of the holiest places of one of the world’s great religions, and its remains contain important evidence about the nature of Buddhist pilgrimage centres from as early as the 3rd century BC. Hinduism is practiced by about 81.3% of Nepalis, making it the country with the highest percentage of Hindus, Buddhism is linked historically with Nepal and is practiced by 9%, Islam by 4.4%, Kirat 3.1%, Christianity 1.4%, and animism 0.4%. A monarchy throughout most of its history, Nepal was ruled by the Shah Dynasty of Kings from 1768, when Prithvi Narayan Shah unified its many small kingdoms, until 2008; a decade-long Civil War involving the Communist Party of Nepal (Maoist) (Now known as the Unified Communist Party of Nepal) and several weeks of mass protests by all major political parties led to the 12-point agreement of November 22, 2005. The ensuing elections for the constituent assembly on 28 May 2008 overwhelmingly favoured the abolition of the monarchy and the establishment of a federal multiparty representative democratic republic.